Believing she was off to help her mother prepare for an event at The Geraghty, Kelly entered the venue. When she pushed through the doorway — the familiar rhythm of Ed Sheeran’s “Perfect” hung in the air and a path of rose petals led to her kneeling man (soon to be fiancé), Taylor. 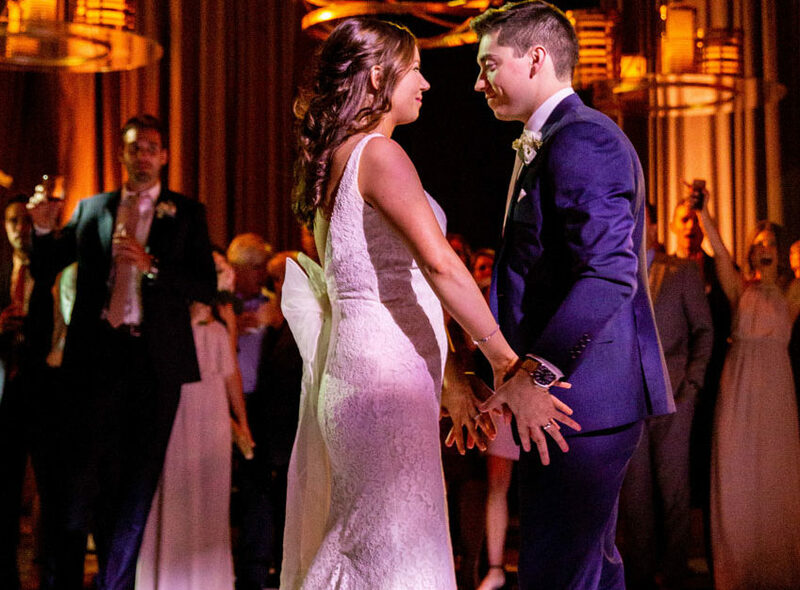 Fast forward — eight months later, 200 loved ones, in The Geraghty, with the same special song — Kelly, and Taylor danced their first dance. 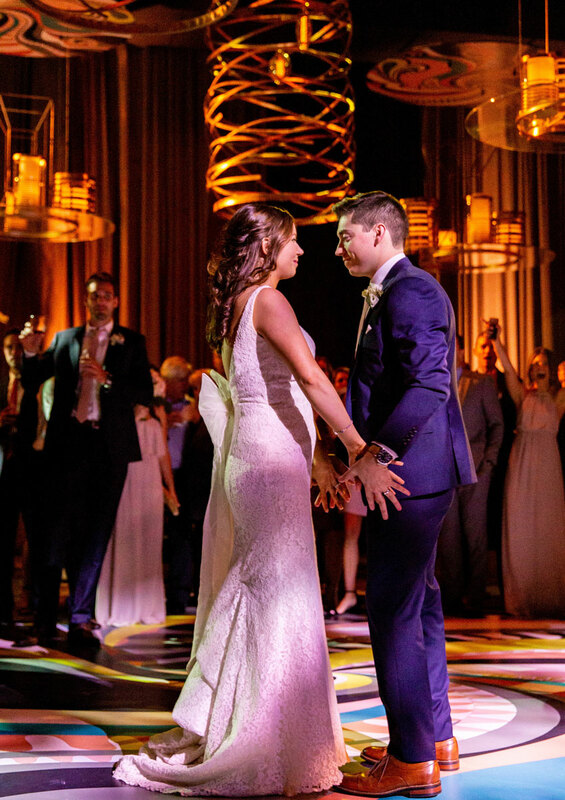 Kelly shared her wedding day vision with Kehoe Designs and BlackOak Technical Productions allowing the teams to design a garden setting that created three uniquely designed spaces for cocktails, dining, and dancing. The overall result was a stylized blend of ethereal, lush, and contemporary wedding elegance. 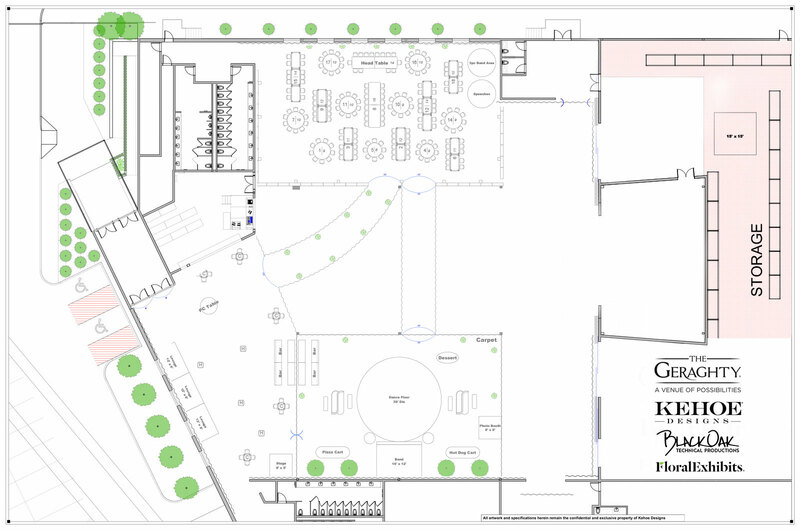 Divided into three separate areas – cocktails, dining, and dancing. Dramatic walkways connected each space. Cocktails – against the north wall, where four 16 ft. windows provided maximum natural light before the sunset. Dinner – positioned against the east wall, where six 16 ft. windows provided an architectural backdrop for the head table. Thirty-six crystal chandeliers hung from the 4,500 sq. 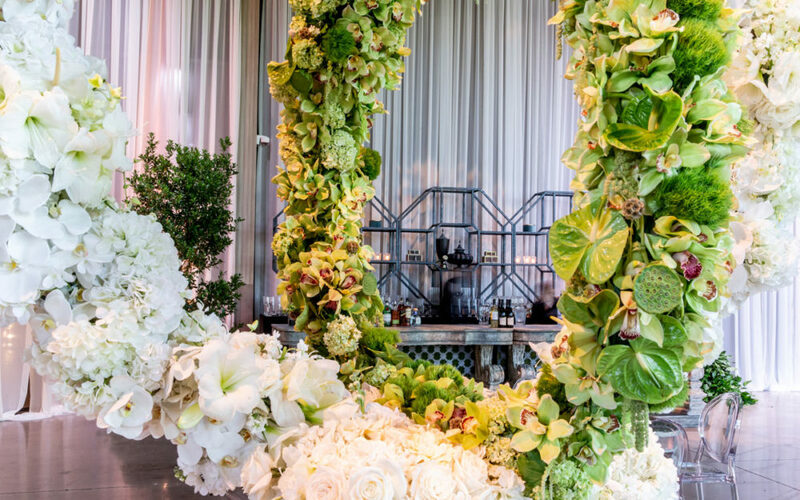 ft. suspended garden above the mirrored tabletops, creating an intimate sanctuary of greens. 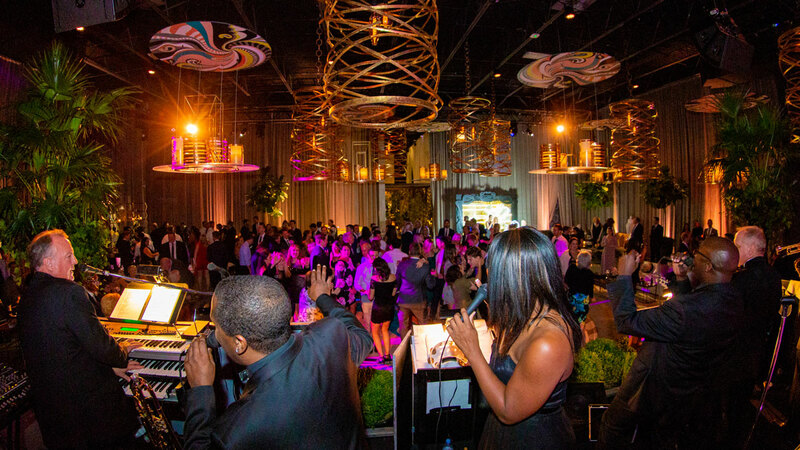 Dancing – positioned against the west wall, staging (24’x12’) elevated the band, and the 21 ft. ceiling suspended large scale thematic décor. A circular 30’ diameter graphic (Pucci inspired) covered dancefloor in the center of the space — offering access to all corners of the room. BlackOak Technical Productions’ team collaborated with Kehoe Designs to design a comprehensive lighting and audio package that served to complement Kelly and Taylor’s vision. The cocktail area, as well as the walkway to the dining room, were enhanced by an ombre of soft uplighting and textural washes. Within the dining area, large velvet walls were warmed with cascading uplights, and patterned accents swept across The Geraghty. Softly focused pinspots highlighted the centerpieces. Speakers were suspended above the canopy of greens — hiding the hardware — but allowing for speeches and musical performances to have an impact without visual interruption. 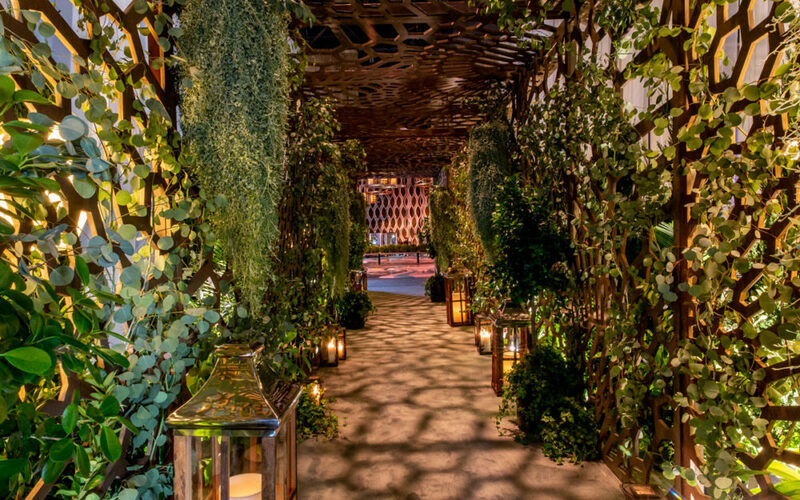 The surprise walkway to the after-party featured overhead light gleaming through patterned panels while lights from below enhanced the greenery, and the chandeliers, which created the feeling of a moonlit forest. Moving lights and swirls of color welcomed guests to the afterparty. 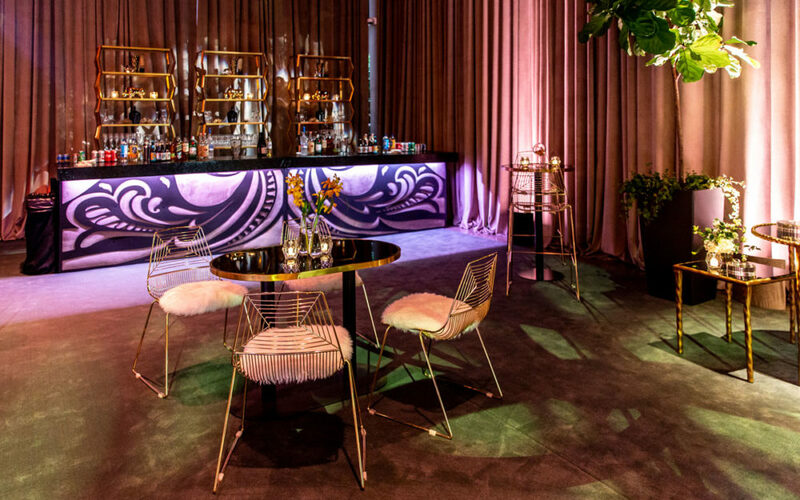 Diffused uplights and texture washes emphasized focal elements and directed interest to the lounges, bar, and dessert station. 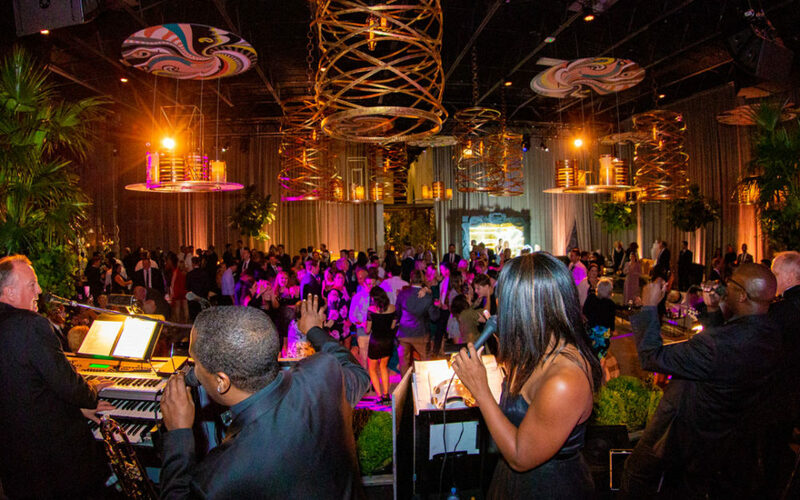 Suspended audio speakers provided powerful sound and uninterrupted views of the party. As the guests entered The Geraghty, they were greeted by elegant, white floral in the foyer. 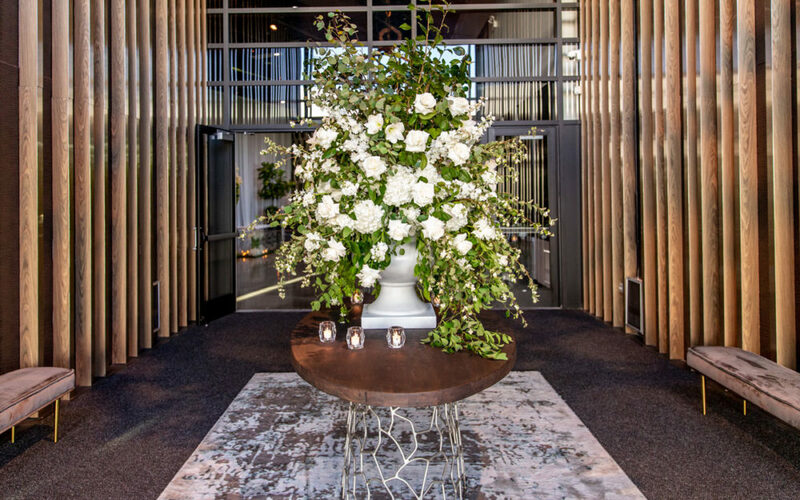 Inside the cocktail space, an intertwined “love ring” focal of paving green and white floral was flanked by two ornamented lucite terrarium place card tables. Lounge groupings provided a contemporary, tailored touch to the English garden cocktail space. Guests followed a dramatically lit, towering chiffon walkway to dinner, which was surrounded by soaring 20’ white velvet walls. 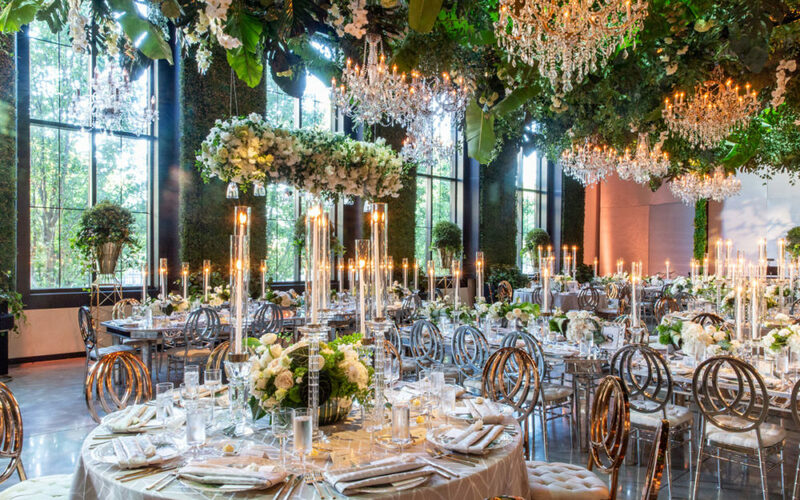 A more whimsical interpretation of the garden aesthetic — the ceiling highlighted a mixture of ivy, maidenhair fern, banana leaves, wild smilax, white phalaenopsis orchids, and other greenery — accompanied with 36 crystal chandeliers. The wall behind the head table featured floor-to-ceiling boxwood with trailing ivy. 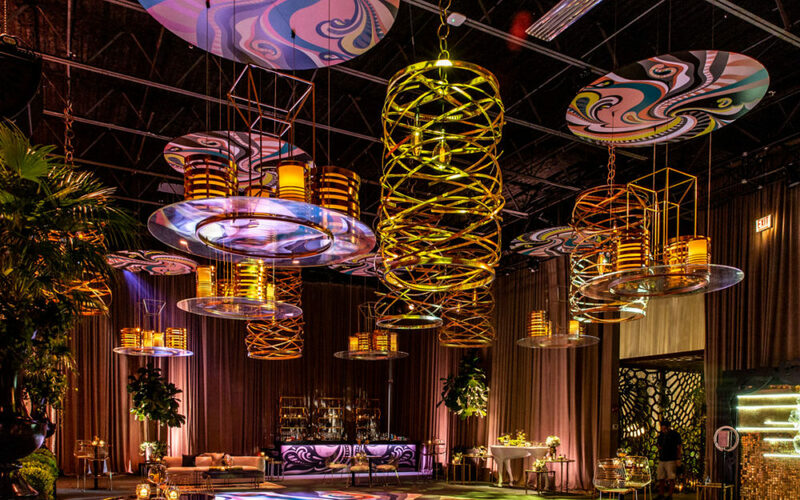 Tall white taper candles on the tables along with the ceiling installation, created intimacy within the space. 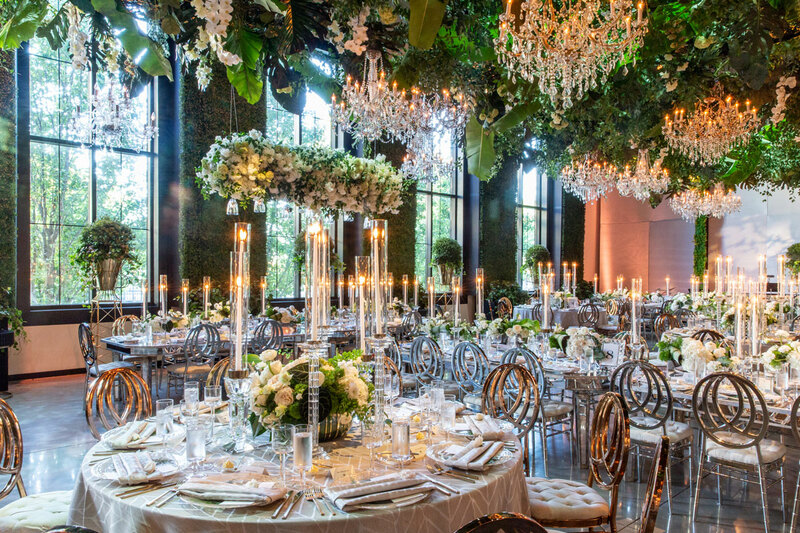 Mirrored tabletops amplified the greenery and soft candlelight. Following dinner, two of the velvet wall panels opened to reveal a surprise. 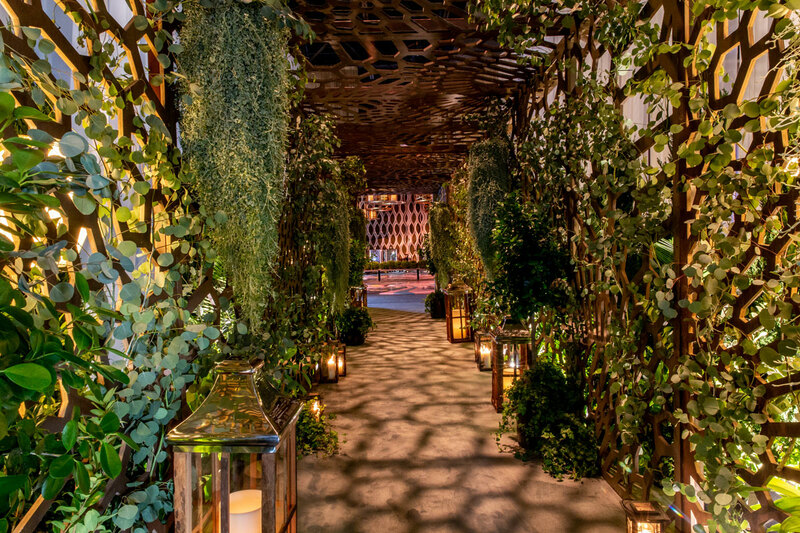 A hidden walkway, laced with greens, and lanterns’ shadows led to the afterparty. The afterparty design was inspired by the swirling patterns and lively palette of a vintage Pucci scarf. 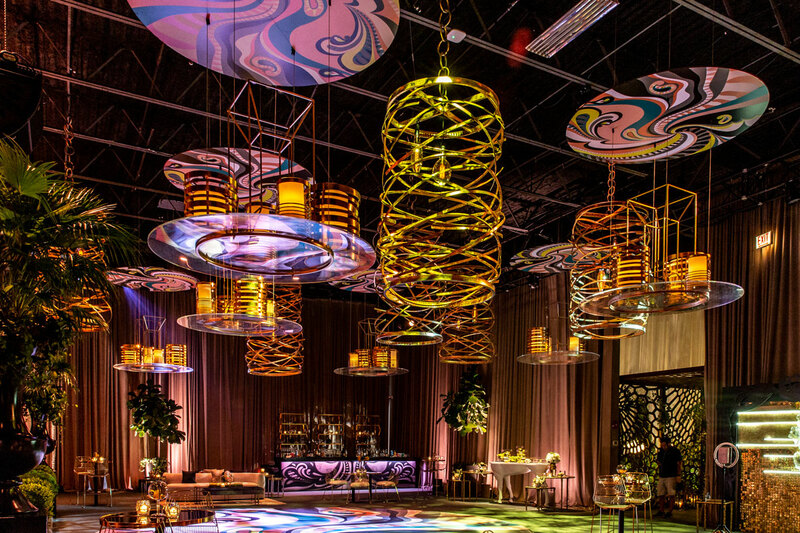 The inspired design was incorporated into a circular dance floor and large suspended discs. This design was also reflected in the details of accent pillows, cocktail napkins, and an upholstered bar front. The lounge featured plum velvet seating, sectional ottomans, and smoked glass tables — all designed with a residential feel. A custom photo op with gold paillettes and a heart-shaped neon light invited guests to personalize their memories. The Geraghty has everything you need for a gorgeous and memorable wedding. Inquire about your next celebration.